Bergen County, V. 1, Double Page Plate No. 16 [Map bounded by Hackensack River, Madison Ave., Prospect Ave.] / by George W. and Walter S. Bromley. Bergen County, V. 1, Double Page Plate No. 15 [Map bounded by Washington Ave., Tryon Ave., Cedar Lane, Hackensack River] / by George W. and Walter S. Bromley. Bergen County, V. 1, Double Page Plate No. 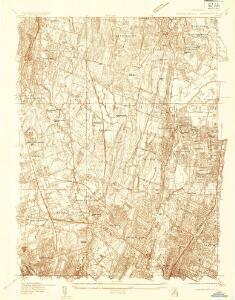 13 [Map bounded by Hackensack River, North St., Queen Anne Rd., Hackensack Ave.] / by George W. and Walter S. Bromley. The Hudson by daylight map : showing the prominent residences, historic landmarks, old reaches of the Hudson, Indian names, &c.
Manhattan Borough and part of Bronx Borough of the City of New York.